I also helped out on Eyes of Luigi for Wizard Jam 3, primarily making sure that Luigi’s singing was synced with Drake! Growing up, I loved to play submarine combat games, particularly GATO and Silent Service II. Then there was Hunt for Red October, which had me completely entranced with submarine warfare, and particularly the use of sonar for navigation and combat. I’ve been interested in making a game about sonar, but don’t have the bandwidth, team, or knowledge to make a complete submarine warfare game. Enter Wizard Jam and an episode title conveniently containing the word “ping” in it. Surely I can try to capture some parts that I loved in those sub games without just copying a sub game. Well, maybe not so surely, which is one reason why I’ve waited this long to start a devlog. I’m feeling good about the concept now, so I’m finally getting this going! You have been placed in a cobbled together underwater defense system to prevent the incoming assault on your home. Your station is a vertical tube, with the ability to monitor the four cardinal directions with active sonar (pings) and fire torpedoes at hostiles that encroach into your defense zone. Pinging targets and then evaluating which ping hits should be used to create a firing solution is how you must supplement the defense tube’s computer and defend your zone. Gameplay will involve visually evaluating the area through your portals, pinging in the different directions, and then evaluating the recorded data to destroy enemies. Here is a look at the current views within a zone. There will be more elements in the main zone soon, but everything is there to track and attack enemies now. The goal is to create a tense, always busy scenario where you are constantly swapping between viewpoints and performing actions with in-game interfaces. I accidentally settled on an aesthetic of “how I remember Myst.” I am not going to ruin my vision by doing research, but just try to make it have a similar electro-mechanical not-quite-right vibe to it all. If you are interested in any of the below, please feel free to send something to me. I am on the Idle Thumbs Slack, and I can send you my email address via the forums PM if you’d like. Let me know if you would like to contribute! I would really appreciate it. Candid photo of you, a pet, or someone you know and have their permission to put into a random WizJam game. A picture someone else took is preferred, as opposed to a selfie. I hope to use these as possible decorations in the tube to help keep players oriented. I might apply filters to your photos to make them look older, or similar processing, but I won’t do anything mean. Also, try to avoid having any sort of technology in the pictures… Like you on your mobile phone or draped across a sports car. One person to do voice work. Needs to be someone who sounds serious and commanding. Need not be male or female specifically. Think either a military person or maybe a slightly off-kilter genius/scientist type. Should mainly be a few intro lines and maybe a handful of other sayings. Thanks for reading and considering helping me out! I will start posting updates and gifs ASAP from stuff I have already done so you can get a better feel for this. The game has been released! Please give it a try! Looks very solid! Curious how this turns out. Ahhh! Been seeing GIFs of this in the slack and now I finally have context. I really enjoy the Myst look you've made for this. I can can send you a picture of my puppy if you want? Same, I have been fascinated by the gifs you have posted in the Slack. I like the idea a lot! This looks very good. The depth in the ocean is hypnotic o.o. The mechanics seems promise. Great work! Yes, please! Slack or pm should work. Oh man sonar is so cool. Excited to see how this turns out! Thanks for reading and for the comments, everyone! And thanks to zero for some adorable pet pics too. The main part of Ping's mechanics will be tracking targets and then plotting firing solutions to blast them. I love the way this is portrayed in movies: tense calculations under pressure before computers just did it all. So, my solution was to have a computer do some of this and you have to decide which ping hits to use and create a firing solution. With a target or two in range, it's not too hard. Hopefully when things get more hectic, it will make for some snap decision making to pick your target. Making this all work with an in-world computer screen was kind of a pain. I figured it would be difficult, but like all things, it was harder. Once I got that figured out, I added an in-game kill counter and some initial explosion effects when you get a hit. 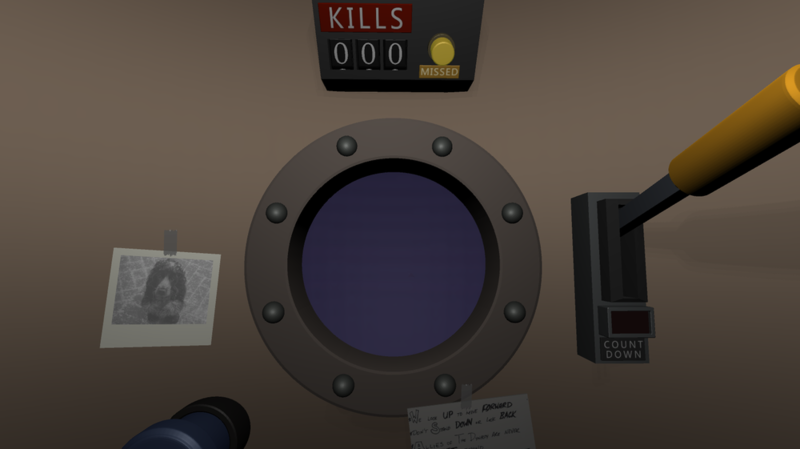 Today I put together the kill counter, which took more time than I thought to model and code. It's much easier to just tell a UI element to change its number without animating numbered dials and telling which one to change and when. This next gif is a lengthy sequence of peering out the portal, pinging targets, and plotting a firing sequence. You can't see this explosion out the portal, so I pull back to watch the kill counter roll. This is part of the claustrophobic feel I was going for. Next up are figuring out how to handle misses, clearing the targets that you hit from the computer, and then determining a spawning routine. Lots to do! I figured it would be difficult, but like all things, it was harder. Been kind of slow getting things done on this project the last couple of days, but I've added a couple of elements into the scene. I added a "missed target" light up on the kill counter, as well as a memento and note that will only be in your starting tube quadrant. Remember to send me your candids and pet pics! They will be super famous, like Zero's adorable dog here in this sample. I tried too many things on the missed target light before just accepting that a bumpy cylinder type light was good enough. It also required different reactions than what I had done on the little panel lights previously. All of this took some time to get looking ok. Oh, and I also had to find sounds for a missed target. Hopefully you will realize you missed when this thing goes off. I think you will. Speaking of targets, I am not so good at Blender, so my enemies are not exciting. That's OK, because you don't see them too clearly underwater. I decided to go with an angular look for several reasons, the best of which is so that you could see them and gauge their heading through the portal. Here is a goofy pic of a torpedo just before striking the target. You will never see this viewpoint in game, it's just something I made and then wondered why. I assume you won't ever get a good look at one of these guys, so I didn't add much detail at all. Tomorrow I am going to start laying out the enemy spawning and escape logic and things. I got some of the foundation set up tonight so I can hit the ground running tomorrow with my coffee(s). I actually started working on my title screen before the final day this time. Does that mean the rest of the game is set and ready to go? Heck no! Regardless, this was my focus when I had some time here and there today. It almost does all of its promised functions too. Need to do some more stuff to finalize, but I think the look is pretty set. I missed the official deadline for submittal this time around, but I'm on the cusp of release. I think all of the elements are in place and working. I just need to decide on and tune the timing of events. Hoping this just takes an evening or two, but who knows. I did cut out a couple of elements that probably won't be missed by the majority of people that play. At least I'm hoping that's the case. Guess I'll find out when the complaints start flowing! - Great claustrophobic atmosphere, and like in your previous games the mood is an interesting mix of ominous and comical. Those strange disembodied voices add to the feeling of disorientation and mystery. - Because the game has otherwise so good and varied audio, somekind of appropriate marine soundscapes to the title screen and the game would be nice. - After dying (which I did alot) you go to the title screen but there's no way to restart. - This could be hard to do because of the 'no HUD/UI' thing, but I'd like to be able to skip the intro dialogue (which is good and sets the tone well) and have an option to read (and revise) the instructions. - Most of the actions are made with mechanical levers and buttons so I briefly missed/forgot that I had to tag the targets on the radar's screen. An added cursor that would appear when hovering over the radar could help in reminding the player that this action was necessary/available. - No bugs or crashes. Thanks for playing and thanks for all of the good feedback! Good input on the soundscapes. I thought about adding some sort of background industrial humming, but decided it would be more annoying than atmospheric. Adding some varied oceanic sounds is a much better idea. Being able to skip the intro audio was something I cut post-deadline. My plan was to have a communications panel that just had a mute button on it that you could press. I might go back and add this, but adding a "quick start" option or something from the opening menu is an easier solution that I just might be able to add without much difficulty. You shouldn't have been able to push the ping button twice! I will have to test that more. The mouse sensitivity is interesting. Maybe I need to turn it up. I have a mouse that can store its LED preferences in the cloud, which is ridiculous, as are its actual mousing capabilities. I'll have to try some normal mice we have around to gauge the difference. Thanks again! This is good input. I had a very sensitive mouse movement as well where the view was jumping from corner to corner when I moved the mouse a few millimeters. So I think a sensitivity option would greatly improve the game. Ha! I ruled that out in case it was just not possible... I'm going to sleep on it and see if I come up with anything workable. Echoing most of the comments above. Glad I downloaded this! Really cool atmosphere and I bet I could have got really good at this if I could reliably hit the countdown lever. I got one kill, but man was it a satisfying kill. Thanks for the game! After watching @TychoCelchuuu and @RubixsQube stream, I have also now seen that the game over sequence has a problem. When you get dumped back to the opening scene... it is supposed to be the same opening scene where you can press start. I swear I tested this, but apparently not. I have just barely started on a fix for the mouse sensitivity adjustment, and I will try to fix this game over problem as well. Thanks to everyone for playing, even if you didn't enjoy it. Got the hang of the game now and got through to the end, love the atmosphere and the story, the voice acting not so much. Presentation-wise: I found the windows pretty hard to see through, I rarely saw any of the ships through them and when I did they where very similar to the background. I think it'd be good if you made it so the x automatically targets as soon as you click the two pings in the right direction. As it is if you leave it or don't know to change it it seems to just miss, but when you click, it automatically hits which feels much better and fine to me. You did it! I'm glad I now know that someone has finished. I was trying to keep the windows kind of difficult to use, but I probably leaned too hard on that and should make them more useful. As far as gameplay goes, I can make one change that will make the initial, provided solution easier to hit by providing a minimum countdown longer than 2 seconds. Seems like even 3 seconds will help people out a lot based on watching people play. Thanks so much for playing and finishing! I liked the atmosphere and the tactile feeling of the interface. I must say that I had no idea what I was doing for quite a bit, but I got the hang of it eventually. The mouse sensitivity felt quite high to me. I'm not sure if it is a resolution issue or something. Thanks to everyone's good input, I was able to make a few (reasonable) improvements. The new version is available with a "motion acuity" slider within the battle station for you to adjust your mouse sensitivity. Hopefully it will allow you to get better control -- either faster or slower. Also, @phill had the good idea of making the firing lever also at the corner of the mouse-look limits like the ping button is. So, now if you are wildly swinging your POV up into the upper right corner, you will be able to click and pull the lever reliably. Give it a try if you had trouble before and let me know how it goes. Thanks, everyone!